Apply for the Outer Banks History Center’s David Stick Internship! The Outer Banks History Center (OBHC) is excited to announce the second iteration of its annual summer internship. The David Stick Internship, sponsored by the Friends of the Outer Banks History Center, is a fully-funded summer position with the Outer Banks History Center (OBHC) in Manteo, N.C. This is a 10-week, full time position performing archival work for the OBHC. The intern will be paid a $4,000 stipend. Additionally, local housing can be arranged for the intern at a minimal cost. Eligibility: The application is open to current and admitted graduate students in archives and records management, library and information science, public history, museum studies, or a related field; and recent graduates of such a program who will have received their master’s degree no earlier than December 2018. Required Qualifications: This position requires attention to detail, curiosity, creativity, and excellent writing and research skills. Prior coursework (at the graduate or undergraduate level) in archives and records management, library science, public history, or a related field, OR prior experience working in an archival repository is required. Applicants should demonstrate an ability to communicate effectively with members of the public, and prior customer service experience is strongly preferred. The ideal applicant will excel at working both independently and as part of a team. Preferred Qualifications: Prior experience arranging, describing, and encoding finding aids for archival collections. Substantial coursework in archives and records management, library science, or public history. Knowledge of current library and archival standards and best practices (especially DACS). Experience working with one or more archival content management systems (Archivist’s Toolkit, ArchivesSpace, Archon, AXAEM, etc.). Knowledge of North Carolina’s coastal history and/or familiarity with the coastal region. About the Outer Banks History Center (OBHC): The OBHC is a regional archival facility administered by the State Archives of North Carolina. The mission of the OBHC is to collect, preserve, and provide public access to historical and documentary materials relating to coastal North Carolina, and to serve as an accessible, service-oriented center for historical research and inquiry. For more information, visit the OBHC website at https://archives.ncdcr.gov/researchers/outer-banks-history-center. How to Apply: Complete the application for the 2019 David Stick Internship here. The application closes Thursday, February 28th, at 5pm. This entry was posted in Job Ads, News, Outer Banks History Center and tagged interns, Outer Banks History Center on February 12, 2019 by Samantha Crisp. When I began working at the Outer Banks History Center, I was familiar with the name Bill Harris. In 2014, I was a high school student and budding historian in Dayton, Ohio researching the history of flight. My history teacher suggested that I contact local historians in North Carolina to expand the scope of my research. I researched local historians to contact, including Bill Harris, as word had gotten out among researchers regarding his extensive collection of local photographs, oral histories, and documents. As a graduate student in Archives and Records Management, I am now processing the Bill Harris Papers at the Outer Banks History Center for future researchers. My internship involves processing the collection according to current archival standards and creating a descriptive online finding aid for the collection. In order to process the collection, I developed groupings, known as series, for the organization of the documents. A notable series in this collection is the Wright Brothers First Flight, which is beneficial for researchers interested in a variety of related topics, including the construction of the Wright Brothers National Memorial, the Anniversary of the First Flight, and the First Flight Shrine. Bill worked for the Wright Brothers National Memorial as an expert on local history, and documents throughout the collection showcase his work with the National Park Service and First Flight Society. Additional topics covered by the collection include Dare County, N.C. and the U.S. Lifesaving Service Stations. Bill Harris (right) at the Wright Brothers National Memorial for the unveiling of the Barnaby Plaque on December 17, 1963. The plaque was a gift from the Soaring Society of America. Perhaps the most impressive series, however, is Local Genealogy. This series contains a large number of oral histories, documents, and photographs that highlight the juxtaposition of an evolving yet deeply rooted Outer Banks community. The Local Genealogy series poses the most difficulties in terms of organization, for local families often intermarried until it was challenging to separate the Baums from the Harrises. As locals tend to say, “Genealogy in the Outer Banks is not a tree, but a vine.” For those interested in researching family histories in the area, the collection provides many opportunities to answer questions and delve deeper into the familial vines that constitute the Outer Banks community. After two months processing these documents, I can verify that this collection extends far beyond my initial research in aviation history. Bill spent his entire lifetime immersed in the unique culture of the Outer Banks, and the collection certainly reflects his knowledge of the area. As the collection covers a wide range of topics and geographic regions, I am confident that it will continue to contribute to the research community long after it is properly stored in boxes and folders. Members of Bill Harris’s family explore his newly processed collection with Taylor’s help, July 2018. This entry was posted in News, Outer Banks History Center, Special Collections and tagged coastal history, interns, Private Collections on July 27, 2018 by Samantha Crisp. The Outer Banks History Center (OBHC) is excited to announce the establishment of a paid internship for the 2018 summer season. The David Stick Internship, sponsored by the Friends of the Outer Banks History Center, is a 10-week, full time position performing archival work for the OBHC. The intern will be paid a $4,000 stipend. Additionally, local housing can be arranged for the intern at a reasonable cost. More information about the position, including eligibility and application instructions, can be found below. Questions about the position, the application process, or the OBHC can be made to Samantha Crisp, OBHC Director, at samantha.crisp@ncdcr.gov or 252-473-2655. Required Qualifications: This position requires attention to detail, curiosity, creativity, and excellent writing skills. Applicants should demonstrate an ability to communicate effectively with members of the public, and prior customer service experience is required. The ideal applicant will excel at working both independently and as part of a team. Prior coursework (at the graduate or undergraduate level) in history, archives, library science, or a related field, or a demonstrated interest in history is required. Preferred Qualifications: Prior experience working in an archival repository, library, museum, or other cultural heritage setting. Prior coursework in archives and records management, library science, public history, or a related subject. Knowledge of current library and archival standards and best practices (especially DACS). Experience working with one or more archival content management systems (Archivist’s Toolkit, ArchivesSpace, Archon, AXAEM, etc.). Experience arranging, describing, and encoding finding aids for archival collections. Knowledge of North Carolina’s coastal history and/or the Outer Banks region. Eligibility: The application is open to current graduate students, recent graduates who will have received their master’s or bachelor’s degree no earlier than December 2017, undergraduate students who will have completed their sophomore year prior to beginning work, and community college students who will have completed at least one year of coursework prior to beginning work. About the OBHC: The Outer Banks History Center (OBHC) is a regional archival facility administered by the State Archives of North Carolina. The mission of the OBHC is to collect, preserve, and provide public access to historical and documentary materials relating to coastal North Carolina, and to serve as an accessible, service-oriented center for historical research and inquiry. For more information, visit the OBHC website at https://archives.ncdcr.gov/researchers/outer-banks-history-center. How to Apply: Complete the online application for the David Stick Internship here. The application closes Sunday, February 25th. 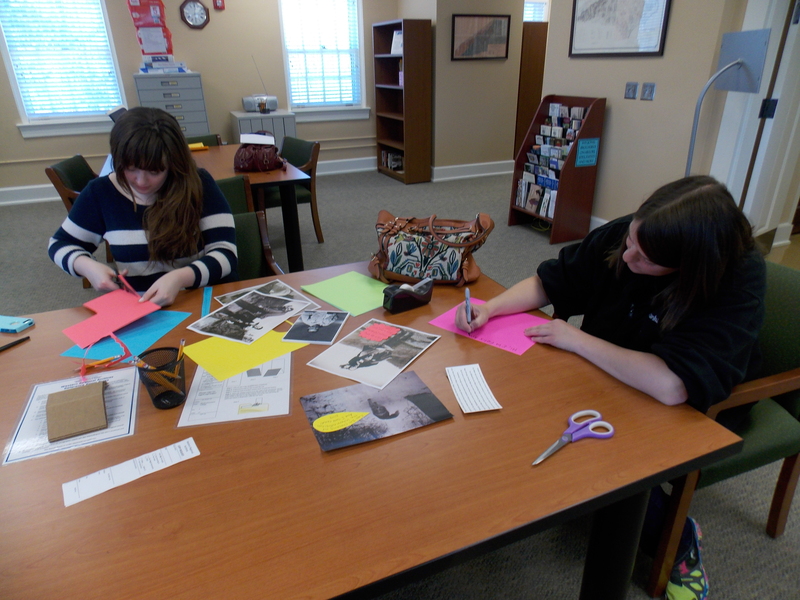 This entry was posted in News, Outer Banks History Center and tagged interns, Outer Banks History Center on February 5, 2018 by Samantha Crisp. The Military Collection at the State Archives of North Carolina is in the middle of a multi-year project to reorganize and provide better description for its World War II collections for its 75th anniversary. Mostly collected by the State Archives during the war, WWII material has been collected continuously since 1945. Every collection holds a connection to North Carolina’s role in military history and the involvement of its residents in military service. For the summer of 2016, the Military Collection is hosting an intern as part of a project supported through the North Carolina Department of Administration’s Youth Advocacy & Involvement Office (YAIO) State of NC Internship Program. The internship project is to process, preserve, and describe WWII collections held by the Military Collection. YAIO Military Collection intern Rebecca Mullins. While reorganizing a collection of U.S. Coast Guard papers, YAIO Military Collection intern Rebecca Mullins found an important document tucked in a miscellaneous file of “Personnel Duty Logs and Operational Records” for Ocracoke Lifesaving Station on Ocracoke Island, North Carolina. In this miscellaneous folder was a three-page, typed document simply titled “Case of Y.P.-389.” The document, created on 1940s tissue-style typing paper (with its brittle edges and faded, typewriter ink text) would prove to make more of a stir for Military Collection Archivist Matthew Peek in a twenty four-hour period than the collection had in its entire eleven years of being housed in the State Archives. The document is a minute-by-minute case report by the Ocracoke Coast Guard Station of the sinking of YP-389 by a German U-boat in June 1942. The boat in the document, the YP-389, was originally a steam trawler called the Cohasset, until it was requisitioned by the U.S. Navy in February 1942 for service in WWII. With the addition of one 3-inch, 23 caliber gun and two 0.30-caliber Lewis machine guns, the newly named USS YP-389 entered federal service on May 1, 1942. Modest in size, the YP-389 was manned by 24 men. The vessel was ill-matched as part of what has become known as the Battle of the Atlantic when, on the fateful morning of June 19, 1942, the German U-boat U-701 attacked YP-389. 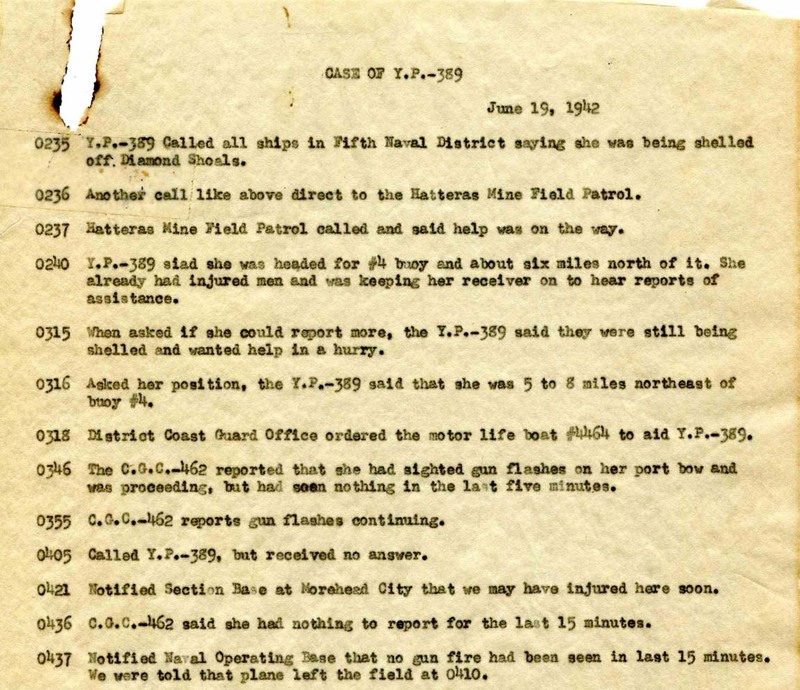 “Case of Y.P.-389” document, from the Military Collection of the State Archives of North Carolina. After Rebecca Mullins conducted further research into the event surrounding Y.P.-389, she discovered that the National Oceanic and Atmospheric Administration (NOAA), had surveyed the wreck site in the 1970s, but the NOAA’s Monitor National Marine Sanctuary was unable to identify the wreck as the YP-389 until 2009. NOAA’s work on identification of Battle of the Atlantic sites and sunken U.S. merchant vessels will result in a Battle of the Atlantic nomination to the National Register of Historic Places. Military Collection Archivist Peek sought the assistance of the North Carolina Office of Archaeology, which connected the Military Collection with the person in charge of NOAA’s work on the YP-389. The Military Collection has provided scans of the document for NOAA, and NOAA will be utilizing this case report of the YP-389 held by the State Archives of North Carolina in its application for the National Register. The work supported through the YAIO State of NC Internship Program this summer is making such discoveries possible in relation to North Carolina’s WWII history. This entry was posted in News, Special Collections and tagged interns, Military Collection, military history, World War II on July 7, 2016 by Ashley. As a Public History minor at Meredith College, I decided to intern at the State Archives in the Digital Service Section. I wanted to learn more about how to apply public history outside of school, as well as learn more about the job duties of an archivist. I was assigned the task to start working on a science & technology digital collection using collections from the State Archives. I was very excited to begin work on this collection not only because of being a history major, but I am also getting a degree in the sciences field. To start this project, I began researching public health, medicine and medical technology, aviation, and patents that were developed in North Carolina or by North Carolinians. I used these key subjects to look for items in the Manuscript and Archives References System (MARS) online catalog, the Guide to Private Manuscript Collections in the North Carolina State Archives, and other resources such as Private Collection or State Agency finding aids to find items that fit the scope of the science & technology digital collection. Once collections were identified and researched, I tagged each item that I found useful from the collections so it could be easily found and scanned later. I also created a spreadsheet that included detailed descriptions of each collection and items for future employees or volunteers working on the collection. 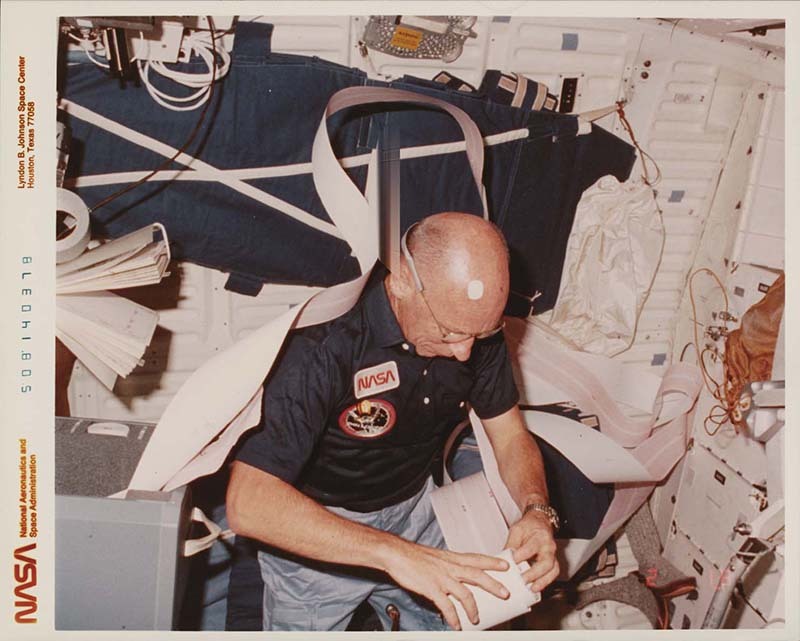 This photograph is of William E. Thornton conducting research on the Challenger space shuttle. During his time on the Challenger, he continued working on his studies of changes in the human body while in space. This image is from collection PC.2054. I have complied various documents and photographs from the mid-1800s to the 1990s that range from photos of Carbine Williams with his M-1 Carbine, documentation on the North Carolina Hookworm campaign, patents of inventions dealing with radio, space equipment, farm machinery, equipment for textile mill, papers from the Bensen Aircraft’s gyro-glider, and William Thornton’s work with NASA. After finishing the research and tagging documents, I have been able to start the scanning process. The documents and pictures that will go in this collection must all be scanned. Information about items in this soon to be digital collection must also be written and put into the digital collections software to assist people who want to know more about the collection. I have also had the opportunity to work on the 1901 Confederate Pension digital collection project. This semester, my honors thesis at Meredith College will be focusing on amputations during the American Civil War, and being able to assist with this side project has been fun since I enjoy learning more about the Civil War. Being an intern at the archives has been one of the best opportunities and experiences of my college career. I have learned more about North Carolina history, which has complemented my passion in science and healthcare. I learned that you do not just have to be interested in public history to volunteer at the archives. I think it is important to be involved in your state’s history, and I have learned so much about North Carolina’s contributions through this volunteering experience. This entry was posted in Digital Collections, Digital Projects, News and tagged Digital Projects, Digital Services Section, interns, medicine, North Carolina Digital Collections, science, technology on August 6, 2014 by Ashley. This semester, the WRA played host and teacher to 12 interns (11 from UNC-A and one from Wofford College). While the number was a bit daunting at times for the archives to take on, the students have been integral to generating interest in the archives. As archivist Heather south describes it, “having so many extra hands has allowed us to blaze through projects and get more materials available to researchers.” From processing collections, indexing ledgers, judging history day and designing a new exhibit, these interns have been hard at work and the progress is amazing. Interns Andrea Smith and Emily Lauher work on finishing touches to exhibit signage for the building. They have created finding aids, learned basic preservation techniques and methods, been on field trips to local repositories and expanded the WRA social media presence making the small branch have record setting numbers. “It has been an unbelievable experience. To think I have become part of the story of these records actually having hands on history is truly amazing” remarked one intern when asked about their time at the WRA. Come see the new exhibit featuring the hard work and insights into the intern program that has got people fired up about history. This entry was posted in News, Western Regional Archives and tagged exhibit, interns, UNC-A on April 10, 2014 by Western Regional Archives. The Thomas Ballance family operated general stores in Hyde County, North Carolina in the thriving antebellum communities of Middletown and Far Creek. Frequently referred to as Middleton and Fair Creek, the businesses appear to have been active between 1846 and 1851. A new finding aid describes the six account books found in the collection. Thomas Ballance Sr. (approximately 1798-1853) owned a warehouse and shipping business in Middletown. Records show that he owned the schooner Walter Merchant from about 1845 to 1847. He employed several other schooners as needed. The account books reveal travel to Wilmington, New York, and Charleston, presumably to purchase goods for the two stores and possibly to supply other storekeepers with goods. When the 1850 Census was taken, Thomas and his wife Dinah Elizabeth Spencer Ballance (approximately 1800-) had seven children. Five of them were blind, including the three oldest sons. William P. Ballance (approximately 1825-), was described as a merchant, while his next youngest brothers, Thomas P. Ballance Jr. (approximately 1827-) and Caleb S. Ballance (approximately 1828-1890) were both listed as clerks. Some of the account books indicate that William had the primary responsibility for the stores under the guidance of his father. Given the clerical occupation of the two brothers, it seems likely that they had some hand in the family businesses as well. Little is known about these men in their later years. William P. Ballance was described as a retail dealer in the New Bern district about 1865 but seemed to vanish from public record afterwards. Thomas P. Ballance Jr. and Caleb S. Ballance lived and farmed together as adults, according to the 1870 and 1880 Censuses. Caleb was also assessed taxes for distilling cider brandy. In his 1890 will, Caleb left his estate equally to his two surviving nephews. Thomas B. Spencer (1849-1936?) inherited directly, while a trust was established for Thomas D. Davis (1878-1933) until he reached his majority. At some point, local inhabitants began referring to the Thomas Ballance family as the “blind Ballances,” perhaps to distinguish them from the many other Ballance families living in Hyde County. Today, the sites of their former homes and stores appear on the National Register of Historic Places as part of the Lake Landing Historic District. In the late twentieth century, Huron Jefferson Gibbs (1903-1999) and his wife, Mildred Lee Burrus Gibbs (1908-2005) operated the Gibbs-Spencer store in Middletown, noted as a pivotal feature in the National Register nomination. The Gibbs family believed that their store was one of the original Ballance store buildings, which had been moved about a quarter of a mile from its antebellum location. There is some architectural and genealogical evidence to support this claim. The Gibbs family and others continued to refer to this historic building as the “blind Ballance store” throughout the twentieth century. This entry was posted in Special Collections and tagged account books, interns, Private Collections on October 4, 2013 by Ashley.